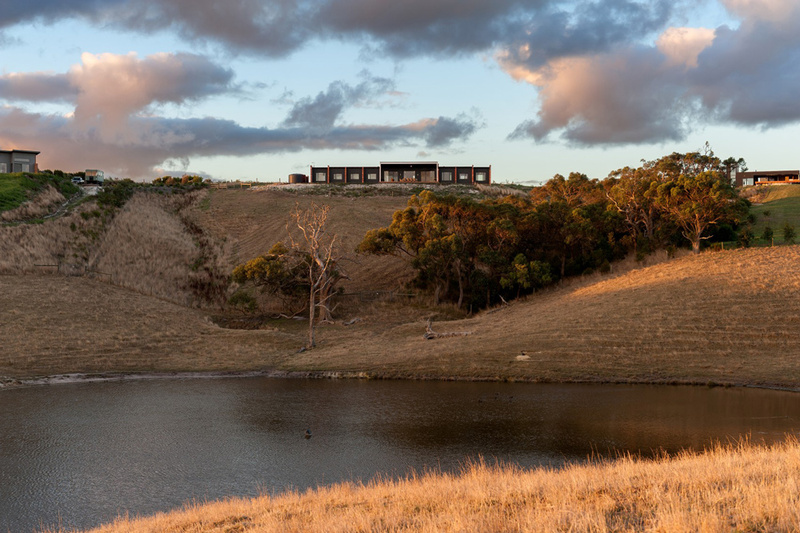 The clients for this project approached us with a simply stunning rural allotment boasting some of Victoria’s best coastal views to Waratah Bay and Wilsons Promontory. They wanted a generous, self sufficient, and low maintenance holiday home design for family and friends. Our approach was to design a contemporary home using reclaimed building materials that not only looks at home in the landscape but draws the outstanding views into every single room in the house. The elongated floor plan provides excellent solar access to thermal walls and living areas, ensuring a high thermal performance rating of 7.2 stars, keeping the home warm through winter and cool in summer. Recycled building materials, including bricks, create a striking façade and complement the hard-wearing corrugated iron cladding. Rainwater tanks store enough water to supply the home’s entire needs. For energy use, the home features a 2kW solar panel system and solar hot water with log fire water jacket back-up. There is an on site grey and black water waste management system, energy efficient lighting, and non-toxic finishes throughout.